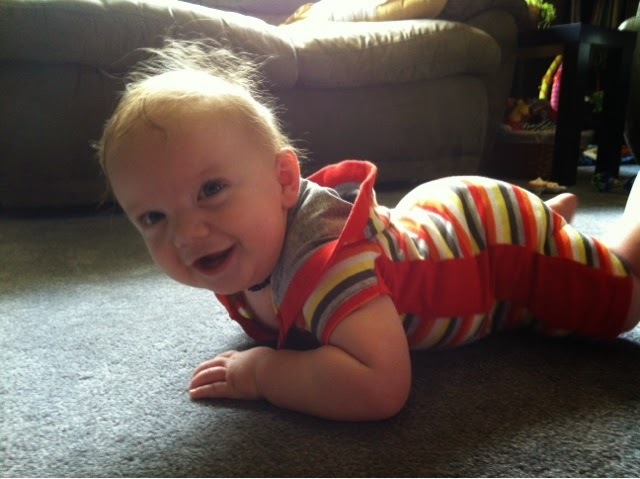 A few weeks ago, Elliott rolled for the first time. He was really sleepy and so I had put him on his tummy in his crib in the hopes that he would fall asleep on his own. He grunted a little in protest, and wiggled around while I went into other room to fold some of the endless laundry an infant brings. All of a sudden I realized that he had stopped fussing. I excitedly crept back towards his room hoping to find him asleep (or almost asleep) but instead found him happily laying on his back! Chris and I were so disappointed that we missed it, and so later that day we put him on his tummy on the living room floor in the hopes of seeing his second roll. He really doesn't mind being on his tummy, but after a few minutes, he started to grunt and fuss. Chris went to flip him over but I stopped him - he was never going to roll over if we turned him the moment he got frustrated! Then he started to get more upset - near crying, but not quite. Again Chris went to flip him over and again I stopped him- asking him to wait just another minute. I was hoping the frustration of being on his tummy would get him to finally do something about it. Chris then said how he wonders if this is how God views us sometimes. Because really, sometimes we're just like a baby who can't quite figure out how to roll over. We're frustrated and crying out to him, asking for him to fix it- to take away what is frustrating us. "Ya," I answered "And I wonder if sometimes He thinks we need to work at it a little first too"
"No," Chris disagreed "I think He's up there just wanting to flip us over"
Sometimes I think I deserve to get a little frustrated before I accept the help that Jesus is offering. I think it needs to get harder before it gets easier. And sometimes that shapes the way I respond to my own life and other people's lives as well. "I can't take it anymore" said Chris as he flipped Elliott over. Elliott still hasn't rolled over again. I'm pretty sure he'll figure it out when he's ready, and until then when he gets frustrated with being on his tummy, I just flip him right over, kiss him and tell him how much he is loved.